One of the origins of the wedding veil is said to date back centuries ago when the groom and his friends would throw a blanket over the bride and capture her. In another origin, the veil was used to keep the bride’s face from being seen before the ceremony. This is usually done in arranged marriages. 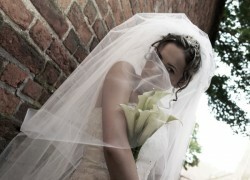 And perhaps the most popular origin and reason for wearing the wedding veil was to protect the bride from evil spirits. Why are wedding veils sheer? The reason goes back to biblical times. Remember the story of Jacob who married the wrong girl? Jacob wanted to marry Rachel, but because he wasn’t able to see through the veil, he ended up married to Rachel’s sister, Leah. The veil was designed to be sheer from then on for the groom to at least see the silhouette of his bride’s face and be assured she’s the one he’s supposed to marry. Then there’s the veil length. Cathedral length veil is the formal length. It falls at least a foot onto the train of the gown. The chapel length veil falls only up to the floor. Elbow length veils are worn with floor length gowns. Shoulder length veils are usually worn if the gown has an elaborate design on the back and needs to be exposed.